Jamie Brandon at Leetown (Pea Ridge) during the June 2018 Training Program. Photo ID ARASHSUD_8655. We begin the new year with sadness in our hearts over the recent passing of our friend and colleague, Dr. Jamie C. Brandon. Jamie became part of the Survey in 1997 when he began graduate studies at the University of Arkansas and became involved in several UAF research station projects. 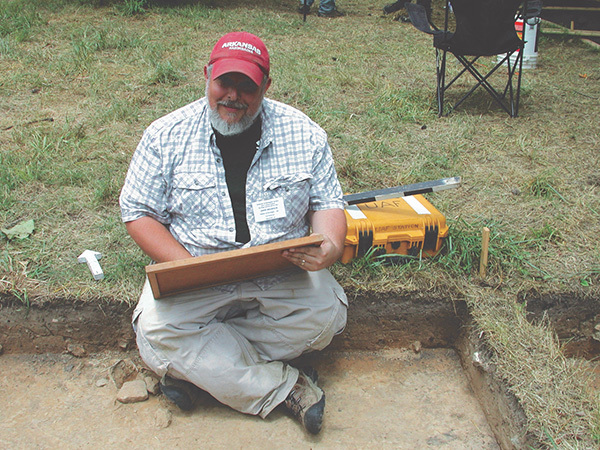 After earning his PhD in 2004 from the University of Texas-Austin, he returned to Arkansas and in 2006 was appointed research station archeologist at the Southern Arkansas University in Magnolia. In 2014, Jamie moved back to Fayetteville to become research station archeologist at the University of Arkansas, Fayetteville. He passed away during winter break, 2018, after a brief but courageous battle with cancer. His legacy is represented by numerous publications on a variety of topics including late Pleistocene human adaptations in the Ozarks, the development of Caddoan cultures in southwest Arkansas, the archeology of Civil War sites across the state, ethnicity and historical memory in the pre-industrial South, and historic cemetery preservation. With spouse Lydia Rees, he also reinvigorated the study of Ozark bluff shelter sites with a special emphasis on bringing new analytic perspectives to the study of collections acquired throughout the 20th century. Dr. Brandon is also remembered for his extensive record of outreach activities including innumerable public presentations on archeological discoveries and their relationship to understanding modern society. He also brought this devotion to the classroom, where he was a popular teacher and mentor to a large number of undergraduate and graduate students. We extend our sincere condolences to Jamie’s family and his many friends and colleagues.